Jana's Genealogy and Family History Blog: Anyone in the Market for a Dehorning Chute? Earlier this week, I shared the news that my 2nd great-grandfather, Ebenezer Perry Carlisle Webster, was an inventor and that he was granted a patent. If you missed that post, you can read it by clicking HERE. This was such an exciting find! Definitely worthy of a genealogy happy dance! Patent Claims Allowed Dec. 10 and Oct. 14, 1888. The best invention in the world for catching and holding cattle to dehorn or brand. 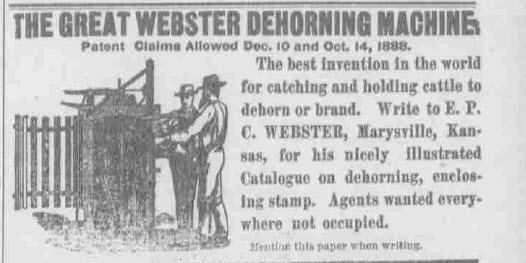 Write to E. P. C. WEBSTER, Marysville, Kansas, for his nicely illustrated Catalogue on dehorning, enclosing stamp. Agents wanted everywhere not occupied. It's just so amazing to find an advertisement for Ebenezer's invention. I wonder how many people purchased his dehorning machine. I have even more fascinating information about Ebenezer and his invention to share with you in upcoming posts.